The 19" rack-mounted rapid prototyping system was the first product over 10 years ago and is still available today. 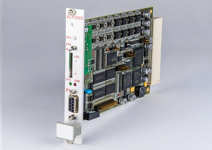 The concept of flexible modules connected by a versatile backplane has matured and proven itself over time. That makes the system still our #1 choice for critical high-power control applications. The system consists of one or two processor cards (XCP), one communication card (XCC) and up to four interface cards (XCI). The processing of all analog and digital signals is concentrated on the processor cards which are connected via the backplane. The interface cards offer output signal amplification, input signal conditioning and emergency handling features such as safe-torque-off. Additionally, the front panels of the interface cards are easily adaptable to arbitrary power electronic interfaces. Communication cards allow connection to standard interfaces such as CAN or Ethernet. Based on two Analog Devices' powerful floating-point digital signal processors (DSP) ADSP-21162, the processor card offers more than enough processing power for even demanding control applications. 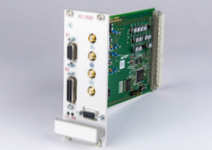 A programmable logic device (FPGA) realizes the real-time signal acquisition and signal generation. As well, local memory, analog and digital I/O and a communication port are available. 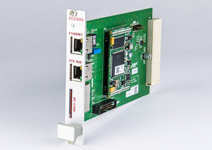 The communication card offers access to 100base-T Ethernet. Additionally, a serial port is available which supports RS-485 or RS-422 connections. The interface cards consist of the module base and a front panel. The module itself offers analog signal adaptation, digital driver and comparators and a pre-configured programmable logic device (CPLD) for error handling. As front panel, several types with standard interfaces for common power modules and -stacks are available to allow a direct connection to the power electronic components via flat ribbon cable. 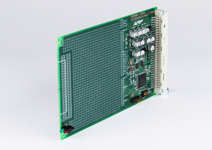 The XCI2020 interface card is intended for analog outputs and digital encoder input and control output signals. Up to eight analog outputs are available which can be used for control or debug purposes. Two incremental encoder inputs (ABZ) are supported. Up to eight general-purpose digital outputs can be connected to the interface card. 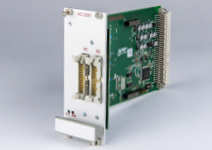 The XCI2030 experimental card allows quick and easy implementations of own additions to the system. A breadboard area is available for own extensions. A programmable logic device (CPLD) is available for custom signal preprocessing or error handling.